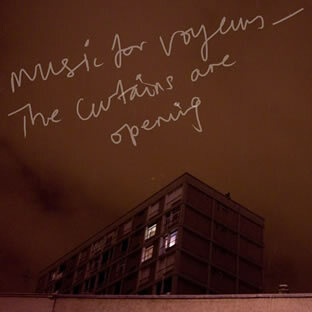 Despite being largely instrumental, Music For Voyeurs’ albums thus far have painted all too vivid pictures of a man moving between personal tragedy, depression and tablet-assisted recuperation. “Television at dawn and joyriders” apparently informed the latest instalment from one man band, Rick Senley. Some pretty electronic layers bring up images of star-filled skies but then comes the thunderous guitar effects to upset the applecart and now the track title of opener ‘I’ve Given Up On Everything’ begins to make sense. The next offering begins as a settled version of sadness too as ‘Save Me’ opens with some gentle piano and welcome blasts of the trumpets (suggesting Bark Psychosis perhaps) but contrasting ugliness comes from an American street preacher-type. Likewise, football chanting interrupts the warped ceremonial melody of ‘Winter Is Coming (To An End)’. So if the first three tracks could be defined as challenging, the rest of the album tones down the sound clashes and concentrates on finding an inner peace. One of the most poignant moments is ’55 And From Wales’ which appears to use real recordings from a telephone dating service, where the loneliness and desperation of some of the contributors is all too apparent. ‘Tablets’ reverts to the pastoral-flavoured loveliness of Senley’s ‘The Long Sleep’, whilst the guitars are layered thick and glistening for excellent wordless contributions ‘The Spirit Of Calming Horses’ and ‘Outdoor Sleeping’. Somewhat unexpectedly, ‘Before Everything Started’ even recalls the melodic patters of Big Star’s ‘Holocaust’. In fact, a relatively quiet second half is only interrupted by more jarring guitar and samples on the closing ‘Screech’. In some ways, ‘The Curtains Are Opening’ sees Senley as the eternal tortured soul. Yet he always injects moments of serenity and beauty into his recordings which indicate there is room for prolonged daylight in his life. For himself and for our own listening pleasure, that has to be a good thing.